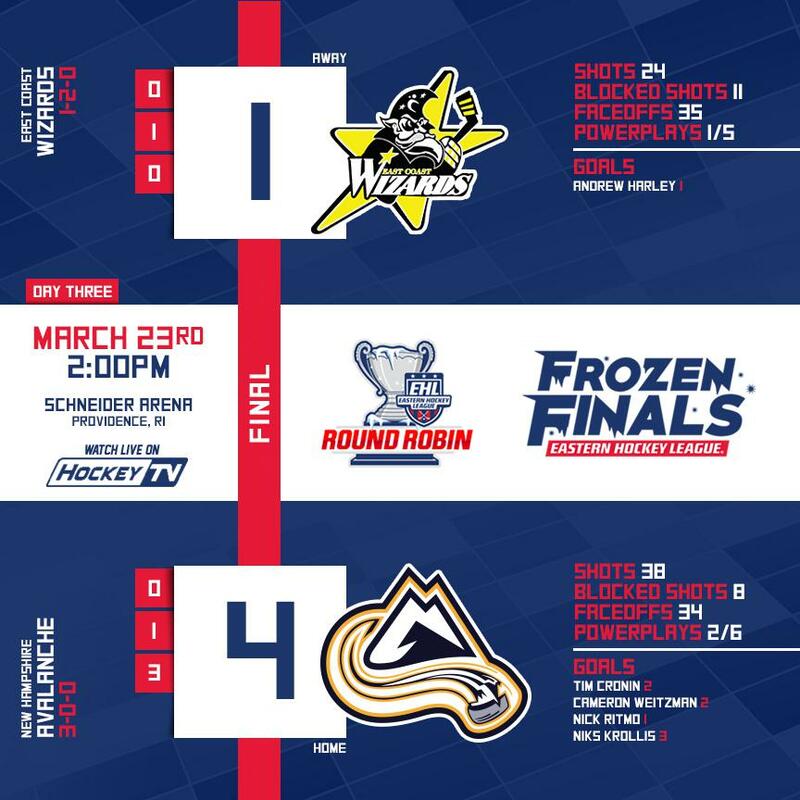 PROVIDENCE, RI -- The Avalanche scored four unanswered goals, including three in the third period, as they advanced to the EHL Championship Game for the second consecutive season. Below you'll find all of the goal recaps from the sixth game of the 2019 EHL Frozen Finals. Despite multiple scoring chances on both sides, both goaltenders stood tall in net in the first frame as the game remained scoreless through one period of play. Andrew Harley snuck a shot short side on Nathan Pickett on the man advantage to give the Wizards the lead at the 15:58 mark of the period. Carter Elrod was credited with the assist on the goal. The Avalanche would answer with a power play goal of their own at the 13:47 mark of the frame as Tim Cronin blasted a slap shot from the point passed Korbinian Lutz to knot the game up at one goal a piece. Jake Mendeszoon had the lone assist on the power play tally. While short handed, Cameron Weitzman gathered a puck in the neutral and capitalized on an odd man rush by beating Lutz five hole at the 13:55 mark of the period. Jake Mendeszoon assisted the go ahead goal. Nick Ritmo gave the Avalanche a 2 goal advantage on the power play at the 9:45 mark of the frame by tipping in a Colin Tracy shot from the point. Mattew Kassab was credited with the secondary assist on the power play goal. Niks Krollis sealed the deal with an empty net goal with 4:14 remaining on the clock.